The world bioreactors and fermenters market is characterized with a largely consolidated business landscape and a low to moderate level of market competition, with the top five players holding for a more than around 63% of the said market in 2015, as noted by Transparency Market Research (TMR) in its recent report. The leading players of the market comprise names such as Danaher Corporation, Merck KGaA, and Thermo Fisher Scientific Inc. and these players dominate the market due to their diversified product portfolios, extensive presence across the world, and an aim for high-growth potential in the emerging markets of Asia Pacific. A few of the leading market players that are operational in the said market for bioreactors and fermenters are PIERRE GUERIN TECHNOLOGIES, Danaher Corporation, Finesse Solutions, Inc., Solaris Biotechnology srl, ZETA Holding GmbH, Applikon Biotechnology B.V., GE Healthcare and PBS Biotech, Inc. Popular strategies of business growth are used by market players in the market comprise strategic collaborations, acquisitions and various other activities that are aimed at expanding their global footprint. Transparency Market Research estimates that the world market for bioreactors and fermenters pegged at US$ 1,779.1 mn in the year 2016, and will reach a valuation of US$ 4,461.0 mn by the year 2024 at a growth rate of 12.2% from 2016 to 2024. 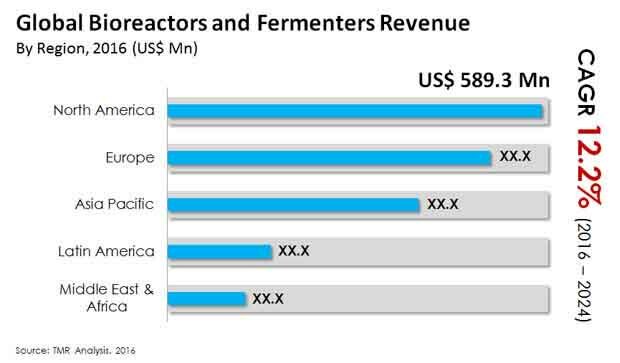 From a geographical point of view, the developed regions of North America and Europe come with a clear dominance in the world market for bioreactors and fermenters market in the year 2015, collectively accounting for a almost around 62% of the international market for bioreactors and fermenters. North America has led the market in the said year, a feat that is mainly attributable to the immense technological advancements that has been achieved in the field of bio-processing systems and the rising adoption of single-use disposable bioreactors. Over the period of forecast, however, the said market for bioreactors and fermenters in the region of Asia Pacific market is prognosticated to be the offer a highly promising growth rate. The leading market factors that are believed to have boosted the international demand for bioreactors and fermenters in the last few years comprise increased adoption of hybrid technologies, which make utilization of single-use and stainless steel systems, and the expanding popularity of single-use disposable bioreactors amongst many of the contract manufacturers and biopharmaceutical companies. The international market for bioreactors and fermenters is also driven owing to the increased prevalence of a number of chronic diseases, which has consecutively augmented the world’s rising need for personalized medicines, drugs for orphan diseases, and biologics. These market factors are anticipated to remain at the helm of all major market developments and these are expected to be noticed in the international market for bioreactors and fermenters over the next few years.